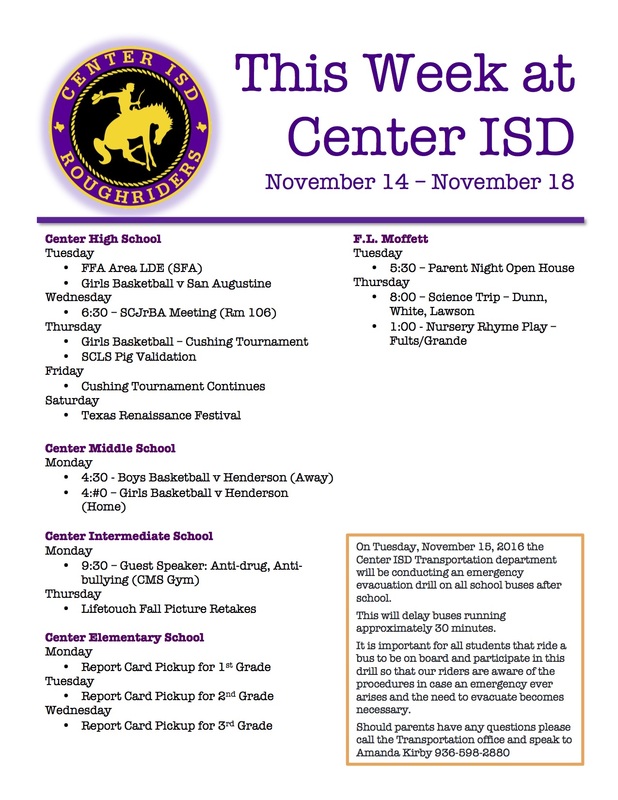 A regular meeting of the Board of Trustees of Center Independent School District (CISD) was held on Thursday, November 17, 2016 beginning at 6:00 p.m. at Center Independent School District Administration Board Room located at located at 107 Private Road 605 in Center, Texas 75935. Tammy Lemoine gave the invocation and Traci Willoughby led the Pledges of Allegiance. Sharon Nelson addressed the Board. Joyce Permenter administered the Oath of Office to the elected Board members: Casey Lout, Allison Johnson and Matthew Mettauer. A motion was made by Traci Willoughby, seconded by Daphne LaRock to nominate James Greer for Board President. With no further nominations, the majority elected James Greer as President of the Center Independent School District School Board. A motion was made by Allison Johnson, seconded by Matthew Mettauer to nominate John Henry Holloway as the Vice President of the Center Independent School District School Board. With no further nominations, the majority elected John Henry Holloway as the Vice President of the Center Independent School District Board. A motion was made by Allison Johnson, seconded by Casey Lout to nominate Traci Willoughby as the Secretary of the Center Independent School District School Board. With no further nominations, the majority elected Traci Willoughby as the Secretary of the Center Independent School District Board. A motion was made by Traci Willoughby, seconded by Daphne LaRock to approve the consent agenda consisting of the minutes from the regular meeting on October 13, 2016, Investment Report (October 2016); Tax Collection Report (October 2016); Financial Reports (October 2016); payment approval over $50,000 and Overnight Student Activity Trips. Administration received three (3) proposals for property and fleet insurance from HIBBS Halmark, Texas Association of School Boards and Texas Rural Education Association. A motion was made by Traci Willoughby, seconded by Daphne LaRock to award the proposal to Texas Association of School Boards for property and fleet insurance. Team of Eight training and Boardmanship 101 will be conducted on Monday, December 5, 2016. The presenter is Kay Douglas, TASB. The Board scheduled the Local Orientation on Thursday, January 5, 2017. James Greer called for a closed session at 6:24 p.m. under Texas Government Code §551.071, §551.074 and §551.129 for consideration of employment of contracted personnel, resignation/retirement and extended emergency sick leave. The Board returned into open session at 7:24 p.m. No action was taken in closed session. 10.1.1 There were no employment of contracted personnel to be considered. 10.1.2 There were no resignations/retirements to be presented. A motion was made by Traci Willoughby, seconded by Daphne LaRock to adjourn the meeting at 7:26 p.m.
Mrs. Crouch and Mrs.Corbell's classes collected coffee mugs for Freedom House. 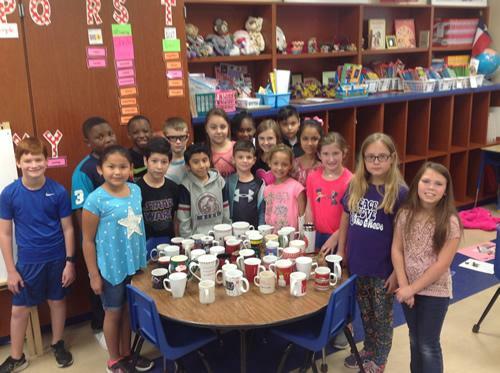 They collected 45 mugs! Center FFA has pecans for sale in limited quantities! $11.50 for 1-pound bags of halves, and $11.00 for 1-pound bag of pieces. Checks payable to: Center FFA. 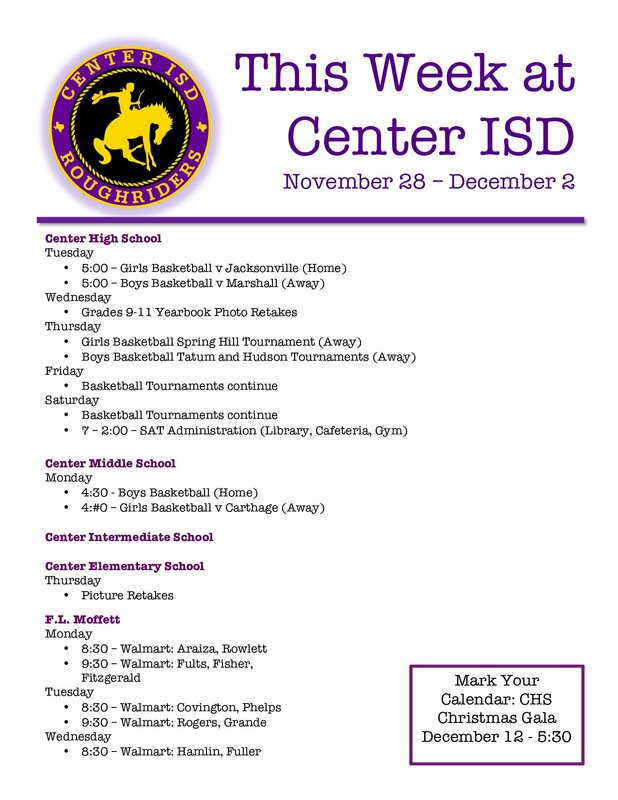 E-Mail Paul Harvey at paul.harvey@centerisd.org or stop by the front office of the High School to collect your order. Thank you for supporting the students of Center FFA! for the 2016-2017 members of all levels of the basketball teams. case an emergency ever arises and the need to evacuate becomes necessary. Also competing were the Jr. And Sr. Quiz teams. and picked their brain about their FFA events. Help CMS Win a I-PAD! <http://redribbon.org/vote/#view/43803/4187942> to vote for the entry. to support the drug-free lifestyle. CISD is proud of Jennifer Ferguson and the students of CMS. to tour Washington D.C. in February 2017! for the trip is $1,802. To view a brochure, click here. their Congressional delegation on the Hill." Roughrider Playoff long-sleeve shirts are now available. 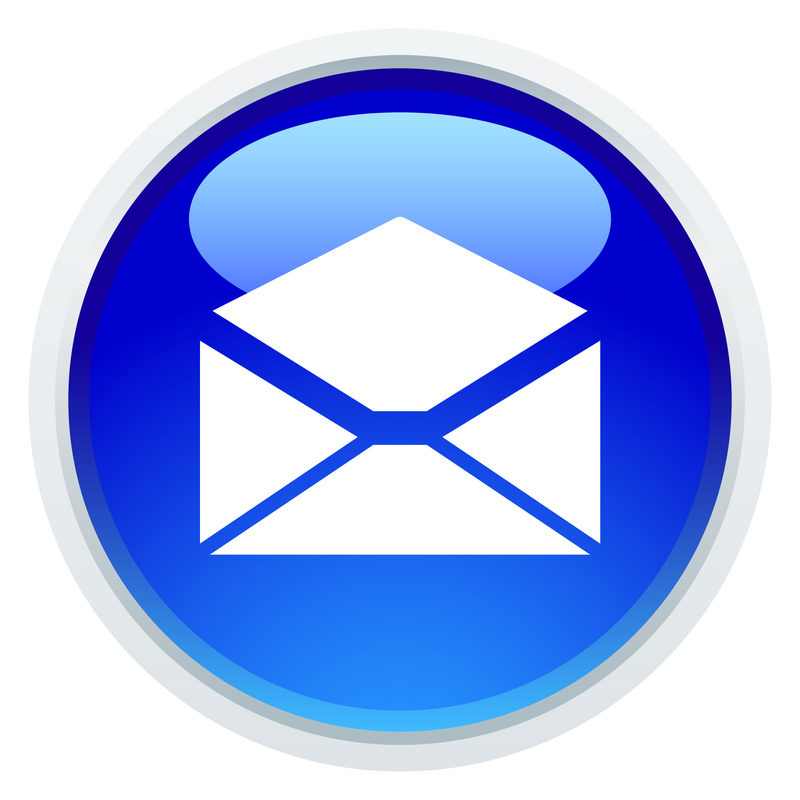 The order form is attached to this email. 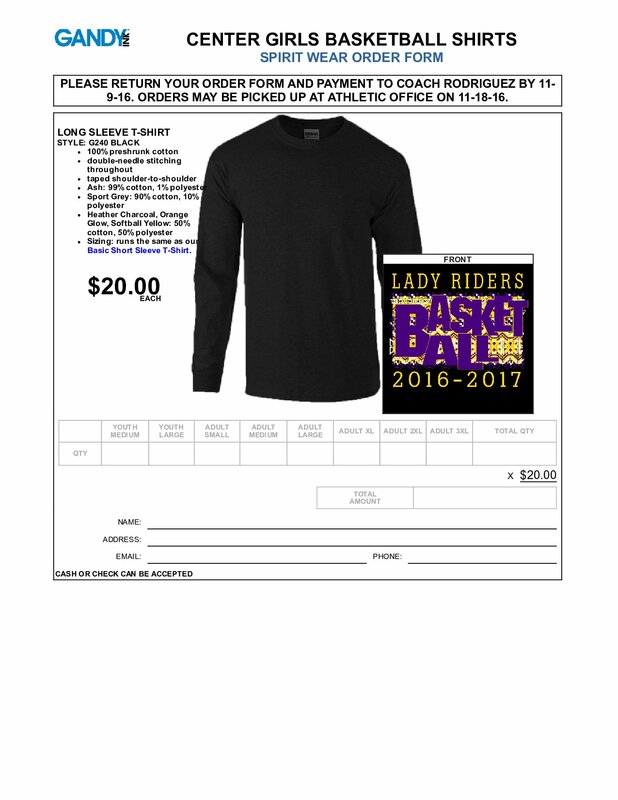 Order forms and money will be picked up from campuses on Wednesday morning. Shirts will be delivered Wednesday afternoon or Thursday morning. can be picked up at the High School on Thursday, November 10th. playoff game Thursday Nov 10th. Officer Matt Haddox was recently honored with an employee recognition award at the Center ISD Police Department. 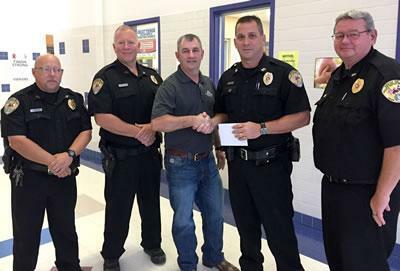 Farmers Insurance and John Michael Burns presented Officer Haddox with an award for his service to the school and community. Farmer is proud to support our local heroes!